– An event, idea, or procedure that effects a significant shift in the current manner of doing or thinking about something. 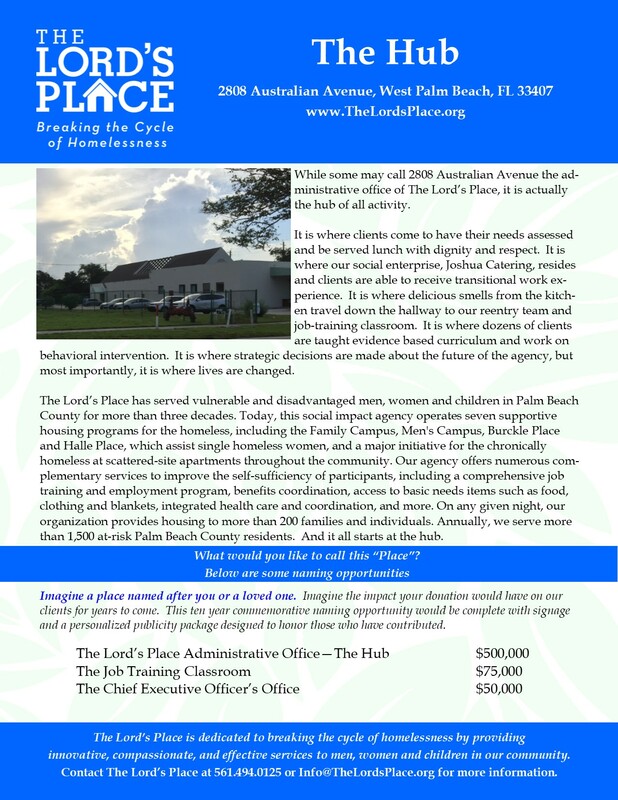 Making a significant contribution to The Lord’s Place programs offers unique opportunities to name our life changing programs after you or someone that is special to you. Here are some game changing opportunities for you to consider. Since 1983 The Lord’s Place Family Campus has been providing services to families in need. This campus is the single most important campus to help us break the cycle of inter-generational homelessness. While teaching parents how to become independent, their children are also learning how to avoid the pitfalls that have led their families to homelessness. Click here to learn how to be a game changer for The Family Campus. Located on Australian Avenue in West Palm Beach, these offices are sometimes called our Administrative Offices. Often times, the building the is the starting point for our clients to receive services. Housing our Job Placement and Training program and Joshua Catering, clients learn life skills and receive work experience here. It’s also where decisions are made about the future of the agency and it’s clients. Learn how to be a game changer for “The Hub” here. If you have an idea how to be a Game Changer for The Lord’s Place contact us at 561.578.4928.